Another group is calling for the ban of "negative games" in Germany, but this time they've got a much fancier (and historic) name. If it feels like it hasn't even been a year since the German government said "nein" to the proposed violent videogame ban, that's because it hasn't. However, German gamers aren't out of the woods yet, because now they must contend with the Knights Templar. No, seriously. According to (a Google translation of) Golem.de, a branch of the Knights Templar - the Ordo Supremus Militaris Templi Hierosolymitani Grand Priory of Germany of North Rhine-Westphalia, Viersen (phew) - has called upon the government to "ban the manufacture and distribution of computer games with negative content." "Negative content," in this case, means precisely what you think it does - violence, mature themes, and all that comes with it. Said Templar branch with the huge fancy name blames "brutalizing computer games" like Resident Evil and GTA for having a negative impact on young people and impeding their social development. Instead, the Templars want to see the government encourage the "production of computer games with positive and meaningful educational approach," and to encourage primary and secondary schools to use these games and the Internet to instruct children in the modern age. 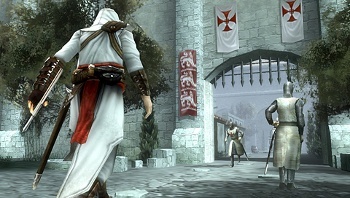 The Knights Templar Bundestag also sees an economic benefit to such a ban, as it believes that barring violent foreign-produced games from the country would make it easier for German and other European developers to create their "positive" videogames. This, of course, is all slightly weird considering that the Knights Templar were officially and forcibly disbanded by Pope Clement V in 1312. Legends about the Templar have kept their name in popular consciousness for centuries since, but this is the first time I've ever heard of a modern Templar order. Someone get Ezio and Altair on the line, quick.